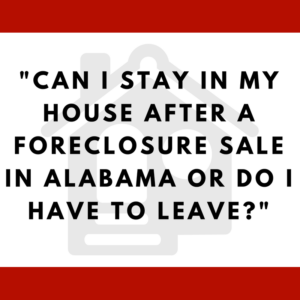 Can I stay in my home after an Alabama foreclosure or do I have to leave? Your house is sold at a foreclosure sale in Alabama — what does that mean about you having to leave your house? We have written a good bit about how to stop a foreclosure but what if the foreclosure goes through? What happens next? After the actual foreclosure, then the foreclosure deed is signed and filed in Probate Court. This is the document that actually transfers legal ownership of your home from you to the person or company who bought it at the foreclosure sale. Note: often times the foreclosure deed is defective and if the foreclosure sale is no good then the deed is no good but you will have to show this in court. It will tell you that you will lose the right to redeem and you will be sued for ejectment if you don’t leave. About the same time you will get a knock on the door . . . from a realtor. The realtor will say that the new owner has offered to pay you money if you will turn over the keys to the house and leave. This is known as “cash for keys” and is to get you out and have you give up any claims you have against your mortgage company. The amount of money is usually between $1,000 and $5,000. (Most of the time the company buying your house at the foreclosure sale is your mortgage company). If you accept the money, you sign the settlement agreement and you leave by the deadline. But what if you refuse to accept this money — this cash for keys? The “ejectment” lawsuit is to eject or evict you from your home. The concept is that it is no longer your home but instead it is owned by the company suing you. Note: an ejectment lawsuit is just like any other. You need to make sure you answer the lawsuit or you will lose by default judgment. For example, you have a mortgage with Nationstar. It forecloses and then sues you. The claim is that it owns the house — not you — so you can’t stay there. The lawsuit will ask the judge to rule that you are kicked out of your home. The judge will assume the foreclosure and the foreclosure deed is valid. So if you have concerns or questions, you have to bring those up in the lawsuit or you will lose those claims. Either side can ask for a jury and both sides can conduct discovery. Discovery is where you ask the other side questions and require them to give you documents. Some cases will be settled. This could be where you stay in your home and the foreclosure is “voided” so it never happened. Other times you will settle and agree to leave your home. If you don’t settle, then the judge and/or jury will rule either in your favor or against you. If you win, you should be able to stay in your home. A ruling against you will normally mean you have to leave your home and may owe the other side money damages for staying in “their” house after the foreclosure. First, decide if you want to keep your home. Sometimes you won’t — most of the time you will want to keep it. Second, if you want to stay, make sure you understand your rights. I can’t tell you how many homeowners have lost their homes simply because they did not learn about their rights. Third, you must take action or else the knowledge you gained is worthless. If you get sued, you must respond in time. Fourth, decide if you are going to do this on your own or hire a lawyer. There are many things you can do on your own but this will be very hard. You will be in circuit court where the rules are much more complicated than say small claims court. And the lawyers that do these ejectment cases are used to dealing with folks without lawyers and knowing how to use the rules to their advantage. Fifth, if you hire a lawyer make sure you know the costs, the expected outcomes, and finally make sure you are confident and comfortable with the lawyer. PS — if you want to chat with us call us at 205-879-2447 or fill out our contact form and we’ll get right with you.